Do you have sugar (or other food) cravings that you want to kick? Do you have disrupted sleep, or low energy during the day? Do you have chronic issues that don't seem to go away? Are you tired (literally) of not feeling like you're in full control of what you're eating? Whole30 is a reset for your nutrition, habits and health. It’s a way to learn more about your body, your food habits and how you personally react to certain foods. For 30 days you will eliminate certain food groups that may be causing issues in your body (and brain), and see how you feel without them. You will learn to pay attention to your mental and emotional state around food and start to create new healthy habits. You’ll learn to listen to your body’s hunger cues and differentiate these from cravings, how to serve up appropriate portions for yourself, how to say “no” to certain foods, and learn more about what triggers you to fall back into bad habits. You'll experience improvements like better sleep, decreases in cravings, improved body composition and many more. After your 30 day reset you will systematically reintroduce the eliminated foods and learn how your body reacts. Once you’ve gone through this experimental phase, you can then make more informed decisions in the future about what you want or don’t want to eat. Vegans/Vegetarians: Whole30 relies on animal protein and eliminates beans and legumes. Because of the lack of compliant protein sources, vegans and vegetarians cannot follow Whole30 as prescribed. If you are a vegan or vegetarian who is still interested in learning more, please contact us. Medical Conditions/Diseases*: While Whole30 may, in many cases, help alleviate symptoms of various medical conditions, it is not the intention of the program nor within the scope of our practice at Everyday Epic to use Whole30 to specifically treat these conditions. It is important that you discuss completing the program with your doctor first. We have resources that we would be happy to send you that you can show your doctor. Conditions/diseases include but are not limited to: pregnancy, diabetes, celiac disease, autoimmune diseases, SIBO, depression, anxiety, eating disorders, and more. *If you have a medical condition, please consult your doctor before signing up. Please contact us with any questions. In 2014 I started my first Whole30 with my husband. We started the day after we learned about it - I saw it as a way to cut sugar out of my diet and hoped it would help me get my cravings under control. It was the first time I really paid attention to what was in my food, and how it was affecting my body. I hadn't realized how bad I was feeling until I started feeling a whole lot better! I started sleeping better, my skin cleared up, I was getting in much better workouts, and I stopped falling asleep in the middle of the day. All those have been great benefits, but the most notable change for me has been my mental state: less depression, a more clear head, and the ability to concentrate throughout the day. Whole30 has taught me that I have much more control over my mood and mental state than I thought, and I’m much happier for it! But lasting change hasn't happened overnight. Each time I complete the program I learn a little more, and create small new habits for myself that stick. It’s been a journey, and it’s still going, but I can see and feel how much better my life is on this path. I became a Whole30 certified coach because I want to open that door for as many other people as I can! • No recreating baked goods, junk food or treats with compliant ingredients. • Don't step on the scale, or measure yourself for the entire 30 days. “A mini reset, 4 major habit practices, and 40 days later I can say I have a new outlook on the tool of Whole30. I was missing the community, the wisdom, the cheerleading, the camaraderie, and a friend to bounce ideas off of. I learned a ton about how I view food, I've committed to a growth mindset, and have completely redefined my idea of what 'failure' means. Meg helped guide me to a realization that motivation gets me started but only habits will keep me going. Meg's constant encouragement, wisdom, and insight feed my desire to make healthy living a lifestyle instead of a phase. She helped me create if-then statements, decide how to tackle special occasions and vacations, and even how to really stop and enjoy some worth it foods. The Basic Group Coaching plan includes 6 weeks of Whole30 coaching. You will spend 4 days prepping, 4 weeks completing the program as written, then you will spend 1 week being coached through a reintroduction period. This is the option for you if you are ready to dive right into Whole30 for the 1st or for the 10th time, and experience all the benefits! If you aren't ready for a full Whole30 yet, contact me about 1-on-1 coaching options! - Weekly group Zoom call check-ins. -Access to a closed messaging group where you can ask questions, receive updates from Coach Meg, and be supported by your fellow Whole30-ers. -Written and video guides on how to navigate the grocery store, how to read labels, how to cook basic staples of the program, how to deal with cravings, and more! -Guidance on recognizing and working on your mindset around food and body image. -Kitchen tips, tricks, and hacks. 6 weeks of post-Whole30 coaching. Our next group starts Monday, March 18th. Have you completed a Whole30 in the past (or multiple) but you could use some additional support finding your food freedom? Join our new Food Freedom coaching group and work towards bridging the gap between Whole30 and “regular” life. If you love how you feel during Whole30 but find yourself sliding back to your same old habit afterward, this is the group for you! We will work on creating sustainable nutrition habits and choosing foods - Whole30 compliant or not - that make us feel great. During this group you will spend 1 week doing a Whole30 reset of your choosing, then spend the next 5 weeks working on nutrition habits, choosing alternatives from food for self-comfort, and learning to navigate different social and travel situations. - Access to a closed messaging group where you can ask questions, receive updates from Coach Meg, and be supported by your fellow food freedom peers. - Weekly habit work that will help you make choices around food and navigate various social situations. - Guidance on how to deal with food cravings without eating. - Guidance on building your plate at meals and how to incorporate what you learned during Whole30. - Guidance on recognizing and working on your mindset around food and body image. - Daily inspiration and support. - New recipes to try. - Kitchen tips, tricks, and hacks. 40 days of 1-on-1 coaching for Whole30 and beyond! I love working with clients 1-on-1! If you're looking for a fully customized Whole30 experience, or you’d like to focus on working towards your Food Freedom, this is the package for you! This package includes 40 days of coaching, which are customized to you based on your goals, and what you would like to focus on. This could be a full Whole30 from prep to reintroduction. Or, it could be a 2-week Whole30 reset, then working on closing the gap between Whole30 and your food freedom. It’s up to you! During the 40 days, we will talk about mindset and work on creating sustainable nutrition habits that you can rely on the rest of your life. Want to add weekly workouts to your package? Just ask! - Flexible start date, choose what works for you! - Weekly phone call check ins. -Weekly habit work, focusing on small sustainable changes. 30-minute strategy session: You will chat with Coach Meg via Facetime or phone, go over any potential roadblocks, talk about best practices, get a pep talk, and ask any questions you might have about the program. This can occur before the program begins, or anytime during the program. "Meg wants you to be the happiest, healthiest version of yourself. That means she’s operating from a place of deep care for each person she’s coaching, and tailoring her approach and ideas to what that individual needs. 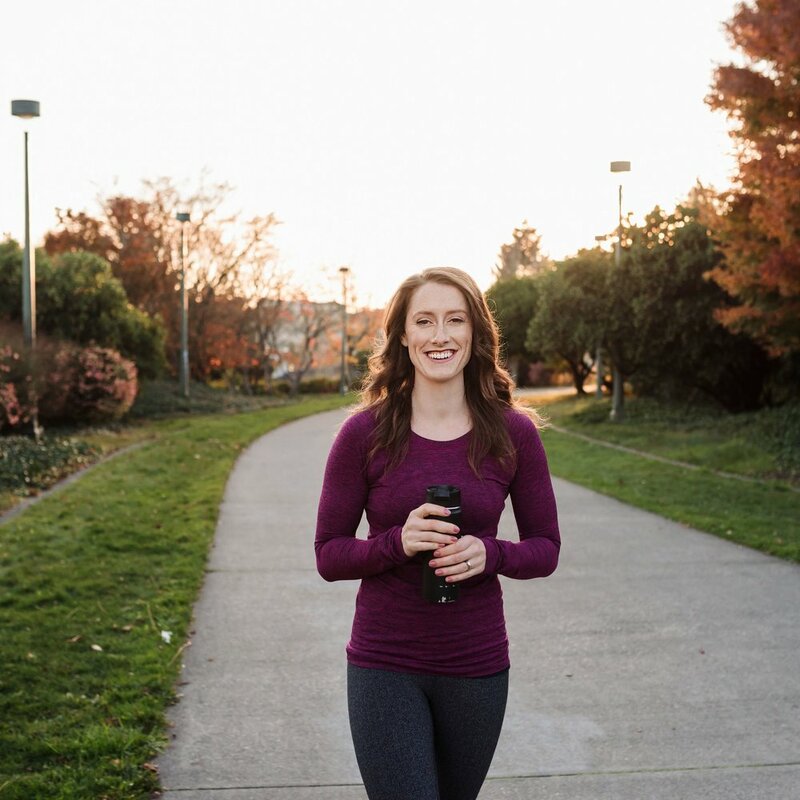 As many of her Whole 30 clients are also people she’s training at her gym, she’s uniquely positioned to offer holistic nutrition and fitness advice. This makes her both highly credible and effective as a coach." Isn’t Whole30 just another diet? No, Whole30 isn’t just another diet. In fact, you don’t even have to think of it as a diet at all. Whole30 is a 30-day reset, that doesn’t require calorie counting or restriction, supplements are replacement meals. You will exclude certain food groups from your diet, but you aren’t required to track, or count, calories. You can eat as much as you want, because you will be listening to what your body needs and eating nutrient dense foods. Elimination only lasts for 30 days - after that, you will add foods back in as you see fit. Sounds pretty freeing, right? The Whole30 program is 100% free to do. You can get all the rules and information you need from the Whole30 website, and many people have successfully gone through their Whole30 journey alone. But the majority of people who have gone through the program say that it’s the Whole30 community that makes all the difference. What I offer as a coach is a way to tap into that community so that you don’t have to feel alone during the process. I offer accountability, so that you don’t fall off track, as well as resources and advice so that you have the information you need to be successful! Working with a coach sounds awesome, how do I sign up? Simply pick whatever coaching package works for you from the offerings above. Click through, and register in just a minute! It’s easy and simple. Once you’re registered, you’ll receive a welcome email within 48 hours detailing your next steps. If you aren’t sure which package is right for you fill out the contact form. I’m always happy to have a phone call with you to discuss your needs and what would be the best fit for you. How will I know what I can or can’t eat? There are so many resources out there for just this question! First and foremost, I will provide you with PDF’s, videos, and websites that have a ton of information and lists of what’s approved and not approved. These will be a great place to start. You can also crowdsource in the Facebook group, or ask me directly. Googling “Whole30 compliant and *food*” usually works well too. Great news, coffee and caffeinated tea are totally allowed! The other stuff you put *in* your coffee will have to make the cut though! The good news is that there are more and more Whole30 approved creamers in the grocery stores. This sounds hard, is it worth it? Such a great question! In short, no. Body composition changes are often a result of Whole30, but not the focus. In fact, one of the rules during the challenge is to not step on the scale during the 30 days! Whole30 focuses on the process of changing the food you eat, feeling better, and getting healthier. This is a chance to move your attention away from the number on the scale and focus on feeling like the best version of you. This all sounds like too much right now, is there a less rigid option? Yes! If you feel like you need to take some smaller steps leading up to completing the Whole30 challenge, you can sign up for our 10-week program! Your first 5 weeks will focus on making smaller habit-based changes like grocery shopping regularly, cooking at home, and portion sizes. Then, your second 5 weeks will ramp up to a full on Whole30 challenge, where you will use all the skills you have been working on to have a fun and successful Whole30! The Habits and Mindset group runs 1x/year. My partner isn’t interested in doing this with me, should I still try? Of course! I would suggest talking to your partner one more time, to tell them why this is important to you and how much it would mean to you for them to join you. Share some recipes with them to show them how well they will be eating on Whole30! Suggest Whole30 meals only for those meals you share, such as dinner. Then they can continue their usual habits the rest of the day. If the timing just isn't right for them, that’s fine, ask them to simply support you while you do it. You can still do it, and you will have great support through the whole thing!